The union representing most offshore workers in Newfoundland is resisting a push by oil companies to resume night helicopter flights. 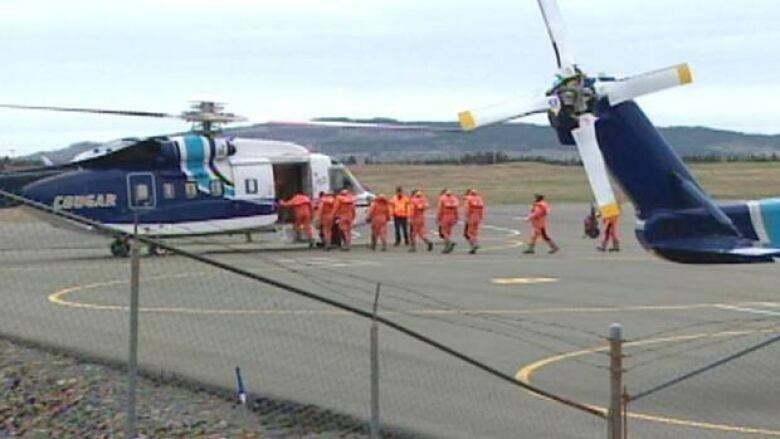 The union representing most offshore workers in Newfoundland is resisting a push by oil companies to resume night helicopter flights to remote sites in the North Atlantic. Brian Murphy, head of the Communications, Energy and Paperworkers Union Local 2121 for Terra Nova and Hibernia workers, says night flights were restricted in 2010 for good reason. An inquiry into helicopter safety after a crash off Newfoundland in 2009 killed 17 people heard that the survival rate for a ditching at night falls to about 40 per cent overall. That's 30 per cent lower than in daylight hours, but oil companies say night flights are sometimes required in the darkest months to avoid backlogs caused by weather or other factors. "The majority of the workforce is against flying at night because of the safety risk," said Murphy, who represents more than 600 workers at the Hibernia and Terra Nova sites. "Statistics show that ditching at night has a higher fatality rate. Bar none, that's the biggest concern that the workers offshore have." Robert Wells, the retired provincial Supreme Court judge who led the helicopter safety inquiry, pre-empted his own report by several months when he called in February 2010 for a restriction on night flights. He spurred the federal-provincial offshore regulator to limit flights after dark or in low visibility until a fully equipped rescue chopper was placed on standby in St. John's whenever workers fly. Murphy offered kudos for improvements since then. They include the addition of at least one standby search and rescue helicopter with autohover capability that can be wheels up in an emergency in 20 minutes, down from the previous one-hour response time, he said. "The improvements that have been made are great. They were a long time coming," Murphy said. "But this return to night flights, it just goes against the safety culture that's trying to be enforced out there in the offshore." At this time, Murphy said night flights are used only for medical evacuations. Requests for comment from spokespeople for Newfoundland's major offshore sites operated by the Hibernia Management and Development Company, Suncor Energy and Husky Energy were deferred to the Canadian Association of Petroleum Producers. In an emailed statement, spokeswoman Jill Piccott said that "flying during hours of darkness is the exception rather than the rule." "We do not currently fly at night. However, there are times when weather or other issues impact the regular flight schedule. It is in these situations where the operator is looking to have the flexibility to fly at night" if the Canada-Newfoundland and Labrador Offshore Petroleum Board approves, she said. Wells stressed in his inquiry report in November 2010 that he could not recommend a return to scheduled night flying. In special cases, he said that a committee including representatives of the regulator, helicopter operator, oil operators and workers should assess risks. "If there is a unanimity that the night flight(s) be allowed, a passenger should nevertheless be entitled to refuse to take a night flight without penalty of any kind," he recommended. "Asking passengers to fly at night adds considerable risk to that part of their work, which is already the riskiest," Wells wrote in his report. "Certainly, no person who objects to flying at night should be forced to do so as a condition of employment." Flights after dark also increase hazards for rescuers, Wells said. He took part in Department of National Defence search and rescue exercises both in daylight and at night over the sea. "Even with aids such as night-vision goggles and bright ... search lights, a rescue in darkness would be much more difficult, especially in bad sea conditions, wind and fog." Wells noted that in Brazil, with similar offshore distances to those in Newfoundland, night flying is banned. And he suggested that oil companies may add an extra helicopter during the darkest months of the year to take more advantage of scarce daylight and avoid flying after sunset. Murphy said that in recent presentations to union leaders and workers, it has not been clear whether operators will accept refusals to fly. Murphy said workers were told this week by oil company officials that the board is expected to decide whether to allow night flights sometime before the end of December.